ROSEMONT, IL — The U.S. National Center for Injury Prevention and Control estimates that more than eight million people are injured annually in slip-and-fall accidents. Since businesses and building owners are responsible for maintaining safe premises, they have been held liable for slip-and-fall injuries that occur due to unsafe conditions on their property. EasyHeat is helping prevent one of the most common causes of slip-and-fall accidents: snow, freezing rain and ice. The company’s Sno*Melter electrical heating mats allow people to walk safely during the winter by automatically eliminating snow and ice, as well as the hassle and expense of shoveling, salting and plowing. Commercial and residential building applications for Sno*Melter mats include parking lots, sidewalks, entry ways, access ramps, loading docks, bike paths and stairs. 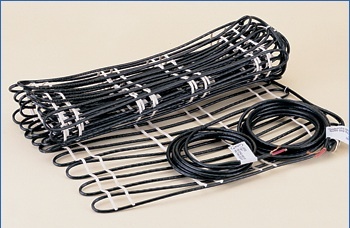 The Sno*Melter system uses highly-efficient, low temperature heating cables formed into flexible mats that install quickly and economically. Available in widths of 18-inches or 36-inches and up to thirty feet in length, Sno*Melter mats are placed below the surface of asphalt, pavers or concrete, and connected to standard voltages up to 480 VAC. A sensor connected to the system measures outside temperature to assure the mats are only energized during freezing conditions. Customers can also choose to install an optional aerial sensor that detects falling or drifting snow, or a ground sensor that monitors the temperature of the surface being heated. Sno*Melter mats can be shaped to fit curved edges to accommodate most walks and driveways. If a design calls for a unique shape or power requirement, custom mats are available from the factory. In addition, there are Sno*Melter step-mats designed for installation on most step shapes without splices.